Happy Fall everyone! 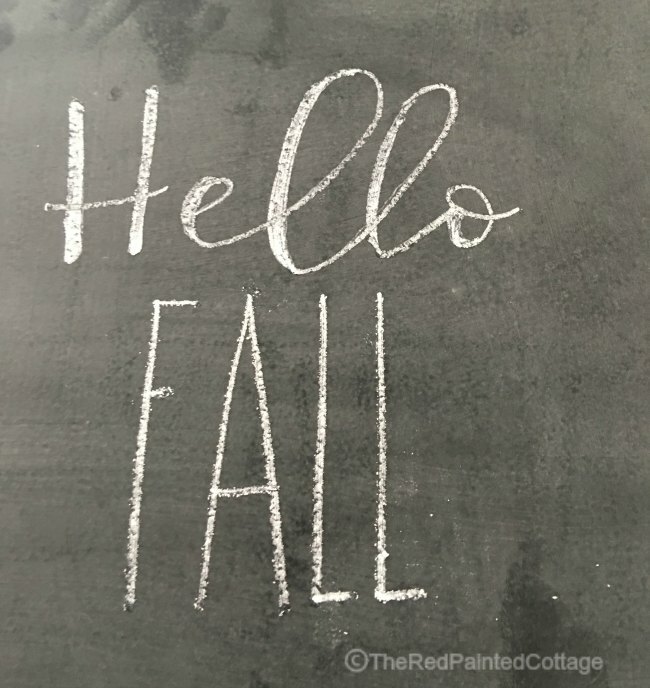 It’s one of my favorite seasons, especially here in Michigan where fall is like a kaleidoscope of color and temperatures! I’ve been kind of absent because I’m just getting over a nasty cold; but unfortunately now Mr. Cottage has it. Because of this, not much has gone on around here, but I’m slowly getting our place in gear for fall. In spring of 2017 I redid our guest bedroom for the ORC. 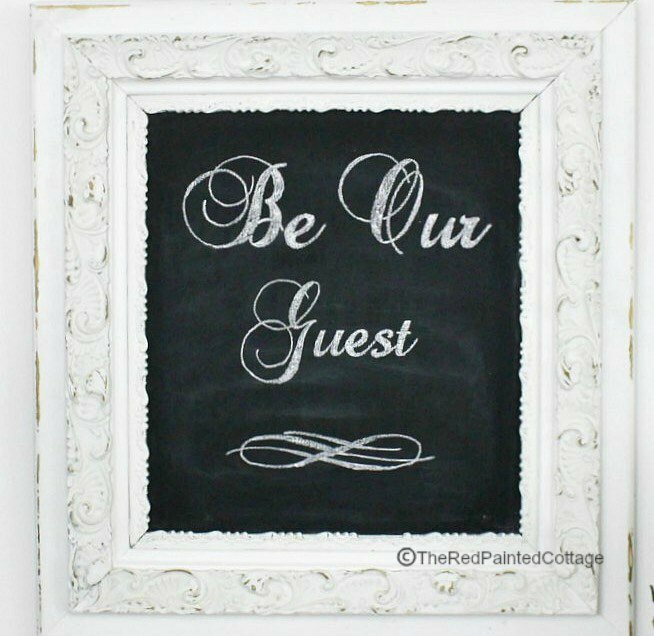 I received many comments on my “Be Our Guest” sign. However, it wasn’t a sign, but I actually wrote the words on a real chalkboard! I never even gave it a thought about taking photos and doing a tutorial on how I did this. I think I was so focused on just getting the room finished in the time we had. So now I’m going to give an easy DIY tutorial for anyone who would love to know how this was done. 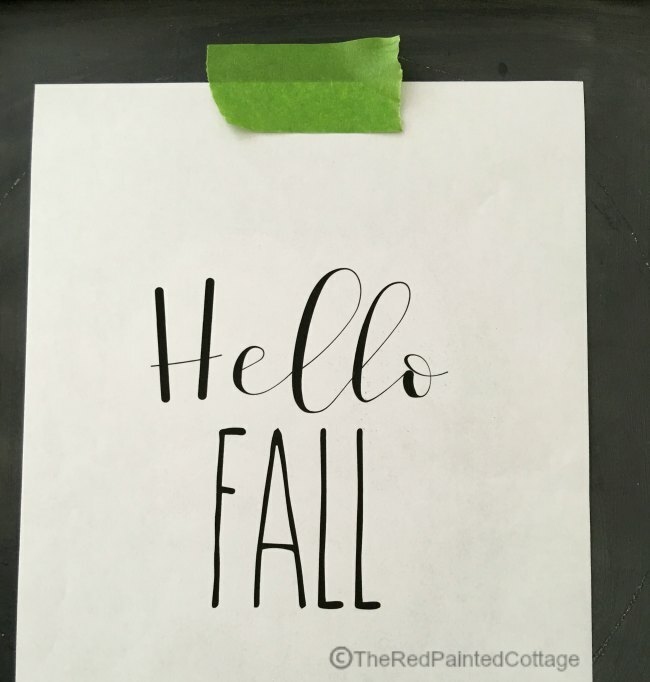 I’ve provided you a simple Hello Fall, above, that you can print and use for anything you want. You can enlarge it or make it as small as you want for a sign or whatever. 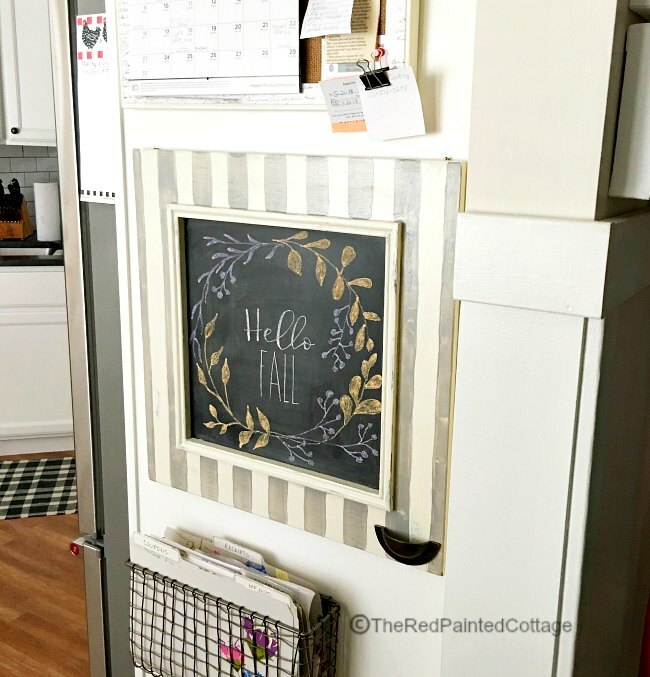 It’s really hard to see, but if you choose to make a ring or wreath around your wording, you’ll want to lightly draw in a circle before you begin your wording. 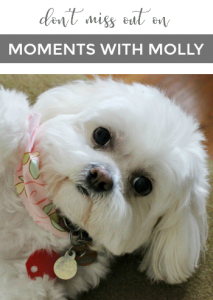 I chose to use a design similar to what I presented to all my email subscribers as a free printable last fall. 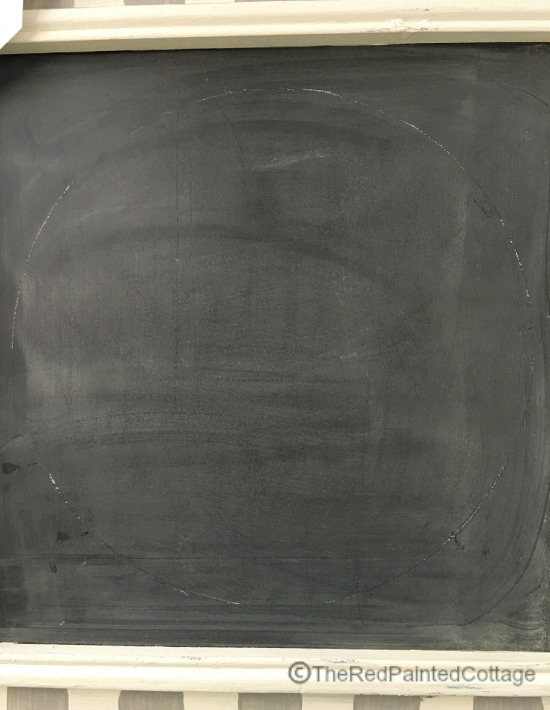 I used a large dinner plate to lightly draw my circle around. 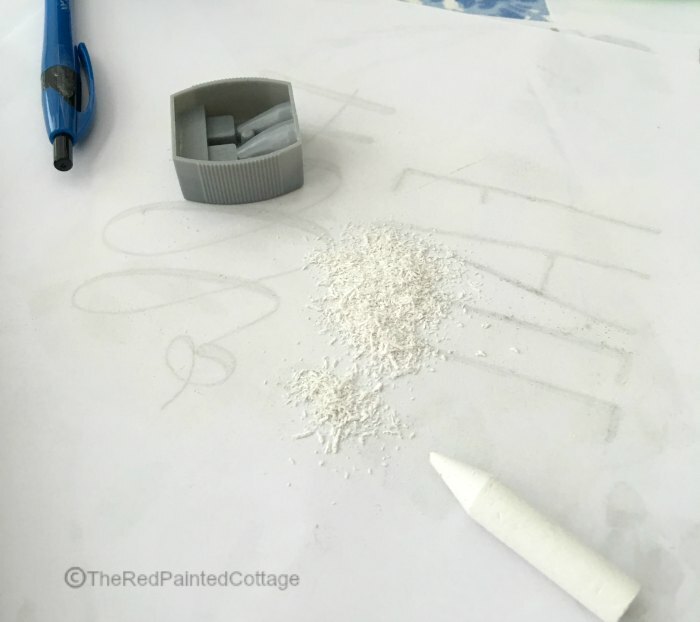 After printing off the wording, lay a chalk on its side and rub the backside of the print as shown above. Make sure all the letters have been covered in chalk. 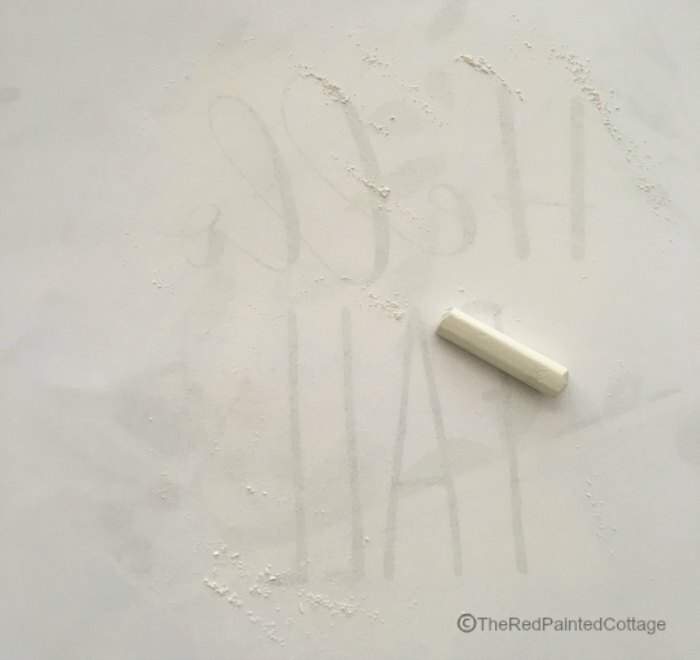 Carefully, lift the paper and lightly shake off the excess chalk. Decide where exactly you want the words to go and then tape it with painters tape. Use a pen or pencil and trace over the letters. In the word “Hello” above, some of the lettering is wider and some thinner. Make sure to trace around each letter, showing the thickness. See Below. Now the fun and easy part begins. 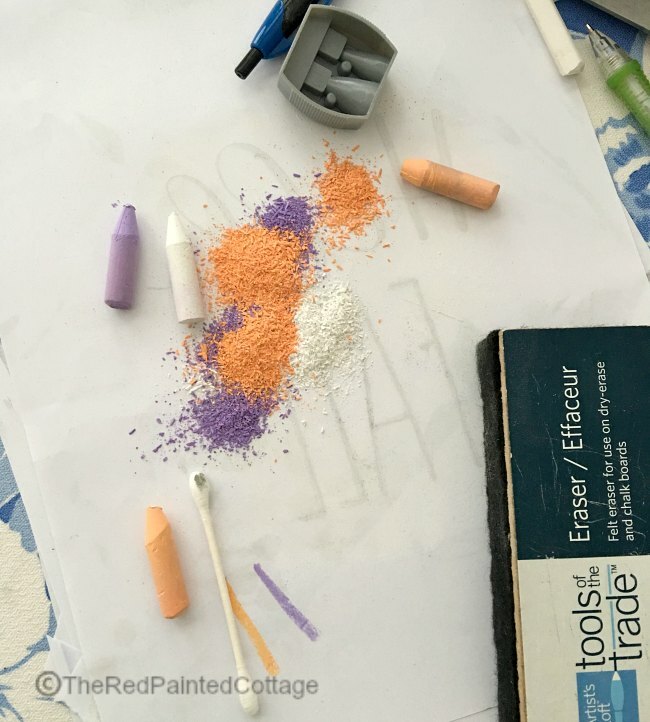 Just use inexpensive chalk and a cheap plastic pencil sharpener that has a wider opening for chalk or chunky pencils. When you sharpen the chalk, do so over a piece of paper or newspaper. If the words are larger, like above, I used my entire arm in moving the chalk. 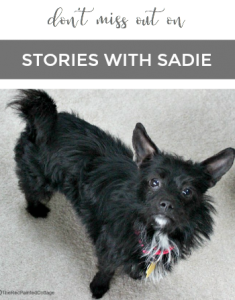 There’s less shaking and more steadiness when this is done. Sharpen all the chalk you use and sharpen often! Like very often!! And if you make a mistake, use a Q-tip to erase and fix it up. This is what is seen when entering from our front entry. 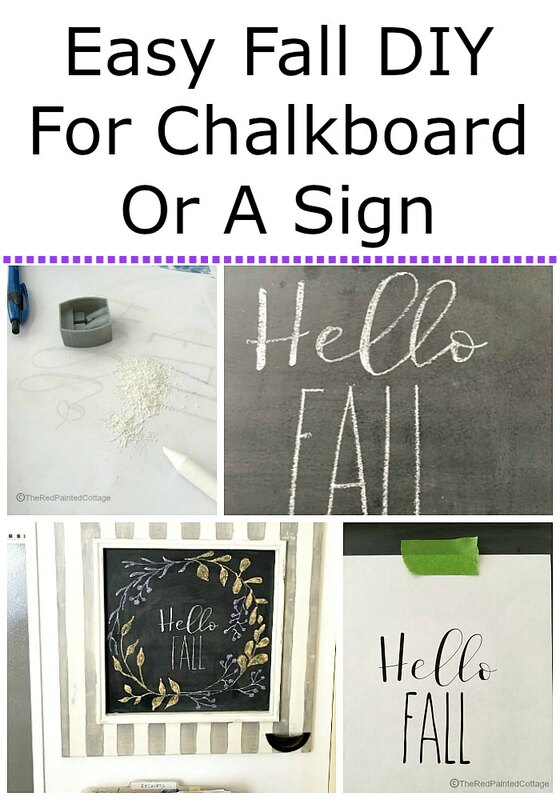 Make sure not to use chalk markers on any surface that might be porous. 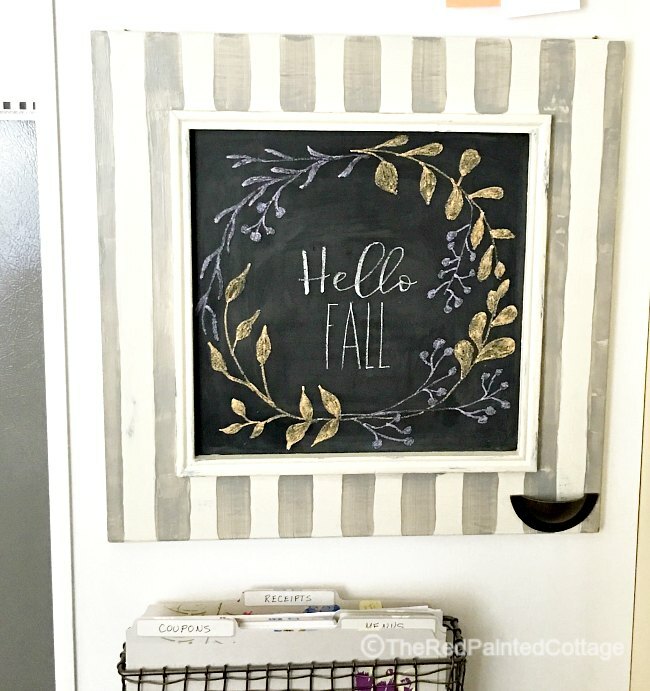 My chalkboard in our guest room is one I made my taking wood and painting it with chalkboard paint. It can only be used for chalk! 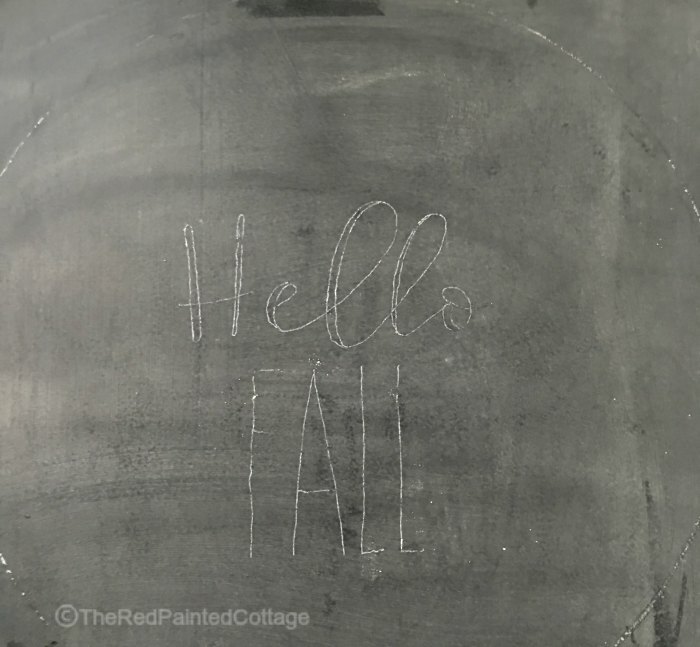 If a chalk marker is used on the wrong surface, it could permanently ruin it. That is just lovely, Carol! Thanks for a great tutorial. It's very pretty! And your instructions are excellent, Carol! Good tip on chalk-sharpening -- I'm not sure I would have thought of that! 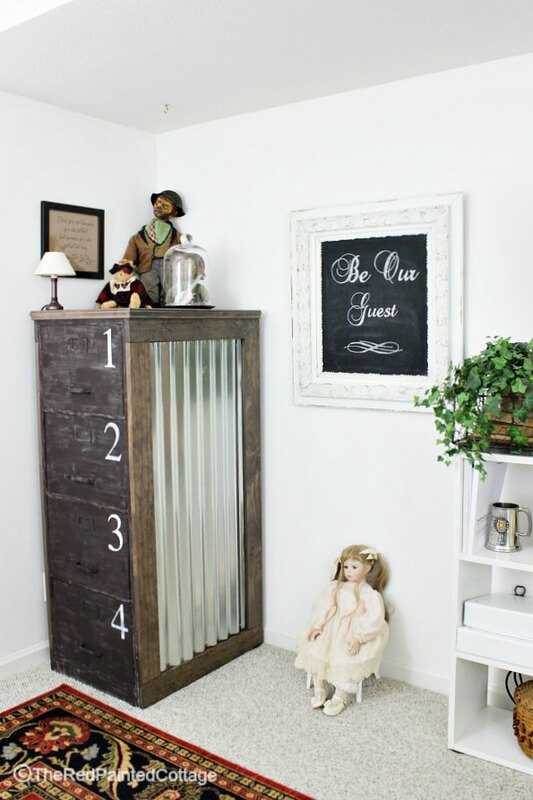 Thanks for sharing your tip at Vintage Charm, Carol!